Two agents of the city government’s Anti-Crime Task Force (ACTF) have been suspended for one month for maltreating two car wash boys, the special body’s program director said. ACTF program director Richard Ligad, also the city information officer, said this Thursday in a joint hearing called by the peace and order and legal matters committees of the City Council. He said his own investigation revealed that two of his agents were indeed involved in hitting the two apprehended car wash boys on the morning of February 22, 2019. The incident happened inside a car wash shop along Rizal Avenue in Barangay Maligaya near the New CBPP Palawan Enterprises. Ligad said he already ordered the one-month suspension without pay of the two agents. “So kung sinuspend, may kasalanan,” said Councilor Nesario Awat who presided the meeting. “Aminado po,” Ligad responded. He still did not name the two ACTF agents. Vice Mayor Luis Marcaida said in the same hearing that what the ACTF agents did to the car wash boys was not the appropriate punishment for whatever law they allegedly broke. 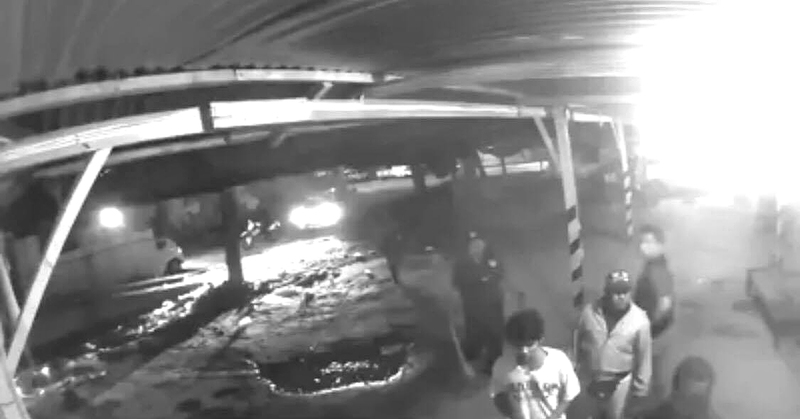 Marcaida and members of the City Council learned about the incident after watching footages from a closed-circuit television (CCTV) camera from the car wash.
“Assuming na totoo ‘yong mga sinasabi ni Mr. Ligad na nag-dirty finger, [and] mabilis ang takbo [ng motor ng mga car wash boys], tama [lang] na habulin ito ng mga Anti-Crime Task Force personnel. Pero, nakita niyo naman po Mr. chairman [Councilor Nesario Awat], ‘yong video na pinakita ko doon sa session hall [noong Martes]. Pinalabas, kinakatok ‘yong bahay, kinakatok ‘yong kuwarto. ‘Lumabas ka diyan! Lumabas ka diyan!’ At [nang] lumabas ‘yong isang tao sinuntok kaagad dito (pointing to the left side of his face), mamaya-maya sinuntok na naman siya, hanggang sa sinuntok na naman siya [ulit], mamaya-maya noong bumagsak na siya, sinipa [pa] siya, sinikmuraan siya,” said Marcaida. Marcaida was the one who brought up the matter to the City Council on March 5 and requested for the appearance of Ligad. Marcaida said further that instead of turning over the car wash boys to the police without harming them, the ACTF members brought them to their main office. Marcaida noted the action exhibited by the ACTF members was a direct violation of human rights. If the car wash boys misbehaved in the past or violated laws, they should be dealt with separately from their current offense. “Bakit sobra o overkill ‘yong ginawang pagkuha doon sa tao? Sobrang pananakit ‘yong ginawa. Hindi [naman] nga [sila] lumalaban, eh. Kung hindi ako magkamali mga lima o anim na suntok ang inabot niya (ng isang car wash boy) bago siya bumagsak,” Marcaida said. However, Ligad still denied that his men “beat” the car wash boys. “Wala pong binugbog, sinuntok lang po at tinadyakan. Ang definition ko po kasi sa binugbog [ay] hindi [ka na] makalakad, binugbog ka na, eh…,” said Ligad. Meanwhile, Ligad said that aside from his personal investigation, there was no official in-depth probe yet conducted on the matter. Awat said the City Legal Office (CLO) must conduct a thorough investigation to give appropriate sanctions to the involve ACTF agents. “The recommendation of the committee is to endorse this to the City Legal [Office] (CLO) for further investigation,” said Awat. In a recent interview with the car wash owner, he said they will push through filing charges and sue these ACTF members. On the other hand, Ligad also presented Emily Vinoya and Edwin Guillermo who claimed to have been hit by stones on December 25, 2018, by some unidentified men standing in front of the same car wash. In a recent interview with Palawan News, Guillermo said he was not able to identify those who threw stones at them. On Thursday, however, he retracted his earlier statement. In his response to the question of Awat and Marcaida whether or not he identified the person who stoned them, he confirmed that the same man beaten by ACTF as captured in the CCTV footage was the same man who threw the stone last year. “Hanggang ngayon po ay kailangan niya pang i-CT scan. Lagi po siyang nahihilo at minsan dalawang araw hindi maka-trabaho,” Ligad said. Ligad also presented various complaints against the car wash boys whose motorcycle parts were allegedly claimed by some individual who went to his office. Ligad said these individuals claimed to own some parts of the motorcycle used by the car wash boys prior to the apprehension. “Meron kasing nagki-claim sa opisina na ‘yong ibang piyesa ng motor ay kanya. Ibibigay na lang ho namin ito. Magsasampa daw sila ng carnapping,” said Ligad.